I have to admit before we visited, I only thought of Bordeaux as a region and not a city, but it's both - an amazing food and wine region as well as a beautiful, vibrant and up-and-coming city. Lonely Planet voted Bordeaux #1 in its List of Top World Cities to visit in 2017 and the city has lately been a top-ten nominee in Europe's Best Destinations and the World Travel Awards ranking it among other prestigious world cities such as Milan, Paris, Vienna, Lisbon and London. These accolades are the result of a smart revitalization plan which began in 1995 under the guardianship of the Republican Mayor Alain Juppe who brought a "tough love" approach to governing the city. He offered tax credits to residents and business owners to incentivize them to clean the filthy facades of their buildings and fines to those who didn't. The bank of the Garonne river was opened up to the city by removing old, industrial warehouses and replacing them with a wide promenade created to accommodate walkers, runners and cyclists as well has restaurants, bistros and boutiques. Another of Juppe's projects was the city's hi-tech tram network which began service in 2003 and now provides three lines of service linking the city centre with commercial areas and the outlying suburbs while easing traffic congestion. The tram cars feature large windows giving riders unobstructed views of the passing cityscape and is powered by underground control units, negating the need for unsightly overhead cables. Bordeaux began to shine with its scrubbed, cream-colored facades, dazzling riverfront renovation and careful blending of modern urban growth with its historic buildings and spaces created in the 18th and 19th centuries. The Bordelais were rewarded for their hard work when the city was classified as a UNESCO World Heritage Site in 2007 and the rest of the world began to take note. Bordeaux was now clean, current, welcoming and its people were proud. Dozens of construction cranes are now part of the skyline as multiple condo projects are in the works to accommodate the expected growth in population due in part to Bordeaux's popularity, proximity to Paris and the more affordable living costs in the Aquitane region. Bordeaux is a three-hour TGV train ride from Paris but soon to be only two hours when a faster TGV train begins service in July 2017. Many who work in Paris and used to live in its suburbs have moved here because of the favorable cost of living and they prefer the commute by train from Bordeaux to sitting in a car in traffic. Bordeaux is also attractive to young Millennials and Gen Xers because of the well-respected university here and availability of entry-level jobs. The wine in this region has always been world-class but now so is the food. There are dozens of Michelin-rated restaurants in Bordeaux including those of celebrity chefs Gordon Ramsay and Philippe Etchebest but there has also been an influx of talented young chefs focusing on market-driven, bistro-style fare at affordable prices. There was so much we loved about Bordeaux but here are our top 12 reasons we think you'll love this region and city too. Enjoy! The Grand Site de la Dune de Pilat is Europe's largest sand dune and is just a one hour train ride from Bordeaux and short drive or bike ride from Arcachon. You can rent bikes in Arcachon and pedal 12 kilometers to the dune to scale its 110 meters (for those who don't like to sink their toes into the sand there is a stairway that leads to the top too). 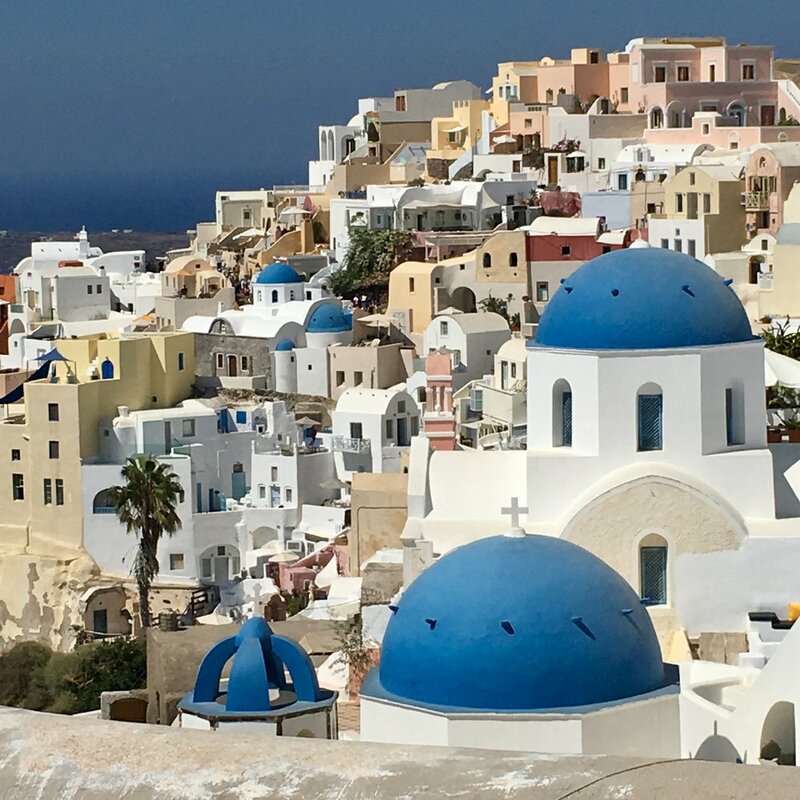 The views from the top are impressive and you can scamper down to the Atlantic Ocean below and a beautiful stretch of beach but remember the only way back up is to hike. The effect of the wind moves the dune one to five meters each year and little by little it is covering a unique forest that dates back to the middle ages. Arcachon is a lively beach town with a wooden boardwalk, plenty of bike paths and charming vacation homes, some dating back to the 19th century when Arcachon was a resort town for the wealthy. Arcachon Bay is a tidal estuary that provides an outlet to the sea for the Dordogne and Garonne rivers. Across the Bay from Arcachon is the still-posh resort area of Cap Ferret where many celebrities have vacation homes including Zinedane Zidane, the retired footballer and current manager of Real Madrid. The biggest draw to Arcachon is perhaps the oysters which are harvested from the bay. Tens of thousands of oysters are cultivated at some 350 oyster farms around the bay and are considered some of the best in the world. Paired with a local white wine the experience is sublime. In the city of Bordeaux, La Cite du Vin will celebrate its first anniversary on May 31. 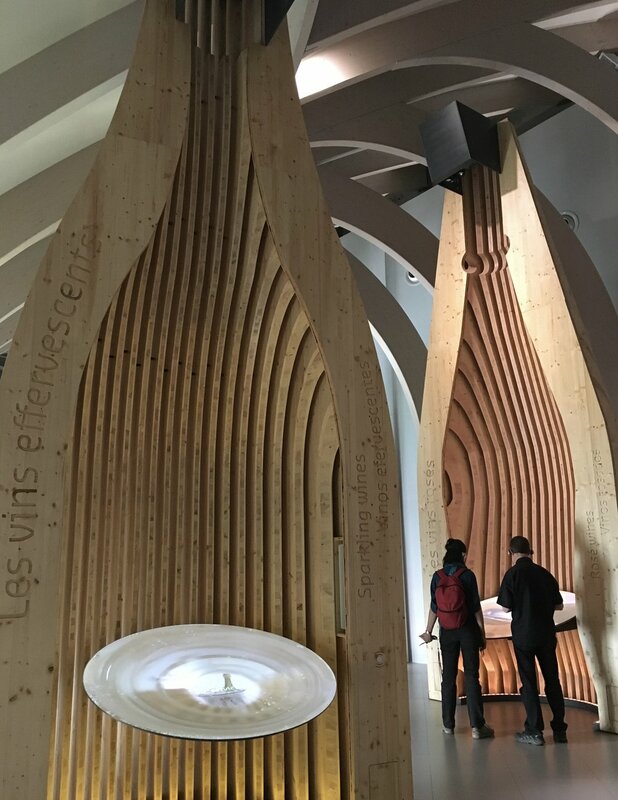 This unique museum of wine culture was officially opened last year by President of France Francois Hollande. It makes a stunning architectural statement on the edge of the Garonne river and houses ten levels of experiences dedicated to the world and culture of wine. 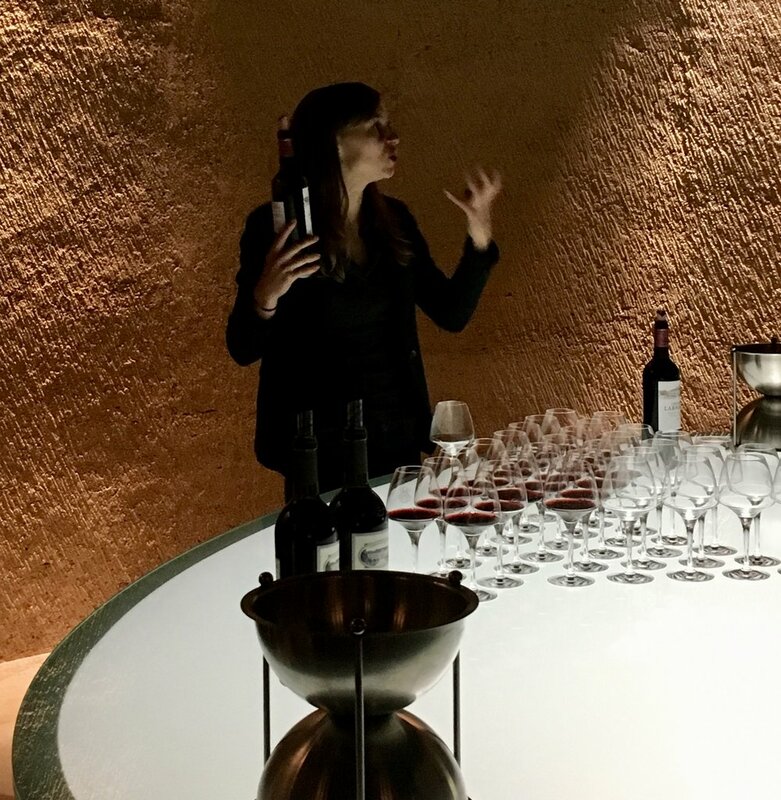 Visitors pass through the building like a river - following a fluid path to hands-on exhibits, films, videos amid sensual surroundings that culminate on the top floor tasting room with sweeping views of the Garonne river, Bordeaux and beyond. Your ticket gets you a tasting from a choice of wines from all over the world. Rue Saint Catherine is Europe's longest pedestrian shopping street at 1.2 kilometers. Saturday is typically the busiest day of the week and the street is jammed with people shopping the large retail chains, small boutiques, wine and food shops. Another option is the many outdoor markets which take place in the towns and villages throughout the Bordeaux region. We found a great hat vendor at the weekly market held in the Citadel of Blaye. The purveyor, Betty Millerate, spoke perfect English and was very helpful in helping Larry and I find hats to take home and wear to the Kentucky Derby. Click here to see our hats at the derby. "Miroir d'Eau," the world's largest reflection pool, sits on the door step of the Place de la Bourse and is a refreshing place to cool off on a warm day. It's like a day at the pool for kids and at night, the reflecting pool is a stunning setting for couples looking for a little romance. Greater Bordeaux boasts hundreds of miles of bike paths both in the city and the surrounding area and is one of France's most bike-friendly cities. Bordeaux A Velo (Bordeaux by Bike) offers tours by highly-experienced guides along the wine routes to visit chateaux or through the streets of Bordeaux for an intimate look at the city. There is a very popular skate park on the promanade and on weekends paddle boarders glide along the Garonne with the Pont Jacques Chaban-Delmas bridge beyond. Another active past time in the city is running and it's very common for the Bordelais to run together in the evening as a date which may explain why the Marathon of Bordeaux takes place entirely at night. The food scene in Bordeaux has everything from take-away shops and brasseries to tapas bars and Michelin-starred restaurants. The markets are also filled with fresh local products including seafood from the nearby Atlantic Ocean. We enjoyed a table-side preparation of Crepes Suzette at Le Bordeaux Gordon Ramsay. From Saint Emilion in the east to Medoc and Pauillac in the northwest to Sauternes and Graves in the south, the wines of the Bordeaux region are varied and very good. Whether your preference in wine is red, rose, dry white or sweet white you will find a lovely wine here and a very passionate sommelier or vintner to share its story with you. And every wine from this region seems to have a rich history. The chateaux here don't just hire people to pour tastings and collect drink tickets, they have extremely knowledgeable staff who really want you to understand what makes the wine in this region and their wine particularly so special. I've never seen such passionate people speak about wine. The Bordeaux region is home to some 10,000 wine chateaux and represents about 1.5% of the wine production in the entire world. Saint Emilion is a quaint medieval village located in the heart of the Bordeaux region and is easily identifiable by the bell tower of its monolithic church. Saint Emilion is named after an 11th century monk who fled Britain to escape persecution by the Benedictine Order and lived in a cave for 17 years and was believed to be a performer of miracles. Guided tours of the cave and the rare underground monolithic church are available and there are many very good restaurants and wine shops in this village. It is definitely worth a visit. The city of Bordeaux is brimming with museums and art galleries but for those short on time and thin of wallet it also has an impressive array of street and public art to enjoy. The cannele bordelais is the local confection of the Bordeaux region. It's a cake with a rich custard interior enclosed in a thin caramelized cake shell baked in a copper fluted molds which gives it a unique shape. The tale of its origin is a bit unclear but two versions that seem to have the most credence are 1) nuns from a convent in Bordeaux (before the French Revolution) prepared cakes made from donated egg yolks from local winemakers who needed only egg whites to clarify their wines and 2) residents who lived along the river Garonne gathered spilt low-protein flour from the loading docks then used it to make sweets for poor children. The cakes come in a variety of sizes but the traditional size is small enough to fit in the palm of your hand and enjoy with a cup of coffee or glass of wine.